All chimes are tuned in the key of C, with the corresponding notes and chords printed on one side of the windplate (a.k.a. wind sail). 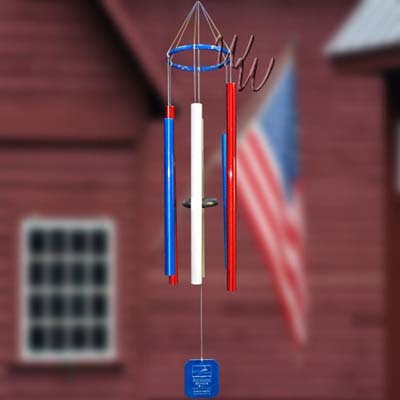 The Patriot Chime is one of our new powder-coated windchimes. Featuring a sparkling metallic red, white and blue color combination, the Earthsong Patriot chime produces a pentatonic scale of ancient origin. Where East meets West, Earthsong is a compelling harmony still heard in the music of many styles and cultures.